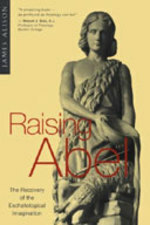 James Alison, Raising Abel: The Recovery of the Eschatalogical Imagination. Let us imagine Cain, sentenced to wander forever over the face of the earth, unable to find a lasting home, always with fear of some vengeance for his brother's murder, and only half-protected by the laws which God gave after that incident, laws whose purpose was to contain the violence of reciprocal vengeance. Cain is getting on now and feels that death draws close. Wherever he goes he hears rumors that something terrible will happen, some fearful end will befall him, with a judgment in which he will be declared guilty. "The trouble with Eichmann was precisely that so many were like him, and that the many were neither perverted nor sadistic, that they were, and still are, terribly and terrifyingly normal. This new type of criminal ... commits his crimes under circumstances that make it well-nigh impossible for him to know or to feel that he is doing wrong." Julian of Norwich was a great English Christian mystic from the 14th-15th century. Her Revelations of Divine Love relate a series of "showings" given by Christ and endorsed by the Church as a genuine message from Christ. Our good Lord once said to me, ‘All manner of things shall be well’ and another time he said, ‘You shall see for yourself that all manner of things shall be well.’ My soul understood a variety of truths in these two sayings. On the one hand, God wants us to know that he does not only concern himself with great and noble things, but also with small, humble and simple things. And this is what he means when he says, ‘All manner of things shall be well,’ for he wants us to know that even the smallest things shall not be forgotten. There is a Wind… that wraps itself around the edges of necessity, tugging and pulling until those boundaries become torn and begin to move to the motion of that which is not visible. I am back in the warmth of the cabin, watching through the window as early spring rains drench the surrounding landscape, low hanging clouds darkening the day. A late snow is coming, but not quite yet. Even though the fire crackles and snaps as it eats through its main course, I still snuggle deeper into the heaviness of the quilt that Papa left for me. She is soon back with a cup of tea, something that smells of wood and mint and a hint of jasmine. I grin. She knows me best, and whatever it is that she is handing me, I trust. "Rough week, eh?” she asks, as if she doesn’t already know. Jesus is our guarantee of God's promise. What happened in his body is the pattern of what must happen in all of the cosmos. We are making up in time, in our body, what happened in thirty-three years in the body of Jesus. We are optimistic because we look at him to see the final pattern. To be a Christian means to be an optimist because we know what happened on the third day. We know that it worked, that Jesus' leap of faith was not in vain. His trust was not in vain, and the Father raised him up. He trusted enough to outstare the darkness, to outstare the void, to wait upon the resurrection of the third day, not to try to create his own but to wait uon the resurrection of God. The Scriptures and early Church seldom said Jesus "rose" from the dead. They always said, "God raised him up!" At the end of Matthew Jesus commissions his disciples: “Go and make disciples of all the nations.” He tells them to baptize people, “teaching them to observe all that I commanded you” (Matt 28:19-20). What did Jesus command his disciples? Am I practicing these things and teaching others to do the same? My goal in this commentary is to combine two ways of thinking about torture and related forms of coercive treatment and interrogation. The first of these ways is a legal analysis of some of the issues surrounding torture, with particular reference to the practice of extraordinary rendition (the use of force, rather than legal process, to take suspected ‘terrorists’ from one country to another for purposes of detention and interrogation), and the existence of ‘ghost detainees’ (people who are secretly held and interrogated by the United States or its allies in undisclosed locations and who are outside the protections of domestic or international law in any practical sense). Although some of my arguments and conclusions on these issues may be surprising or at least debatable, they will be set largely within a familiar context of legal argument and analysis.